Since my skin becomes especially sensitive in the cooler months, I have to be very particular with the products that I use and the process that I use them in. The seasonal transition months is when my skin becomes the most dry and aggravated, so keeping it moisturized is my top priority. 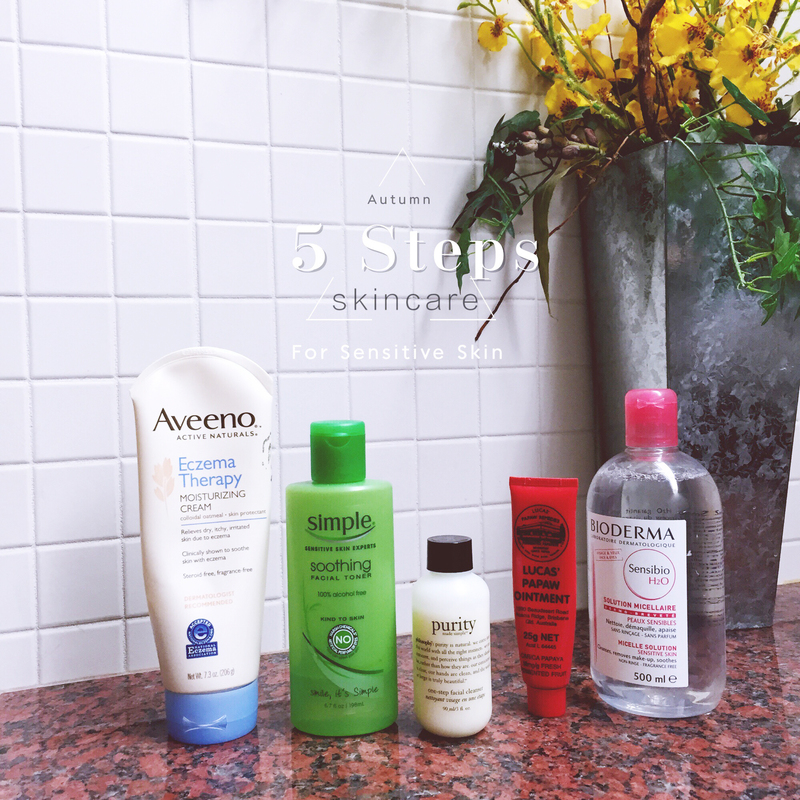 I thought it would be helpful to share my 5-step sensitive skin care routine for fall. 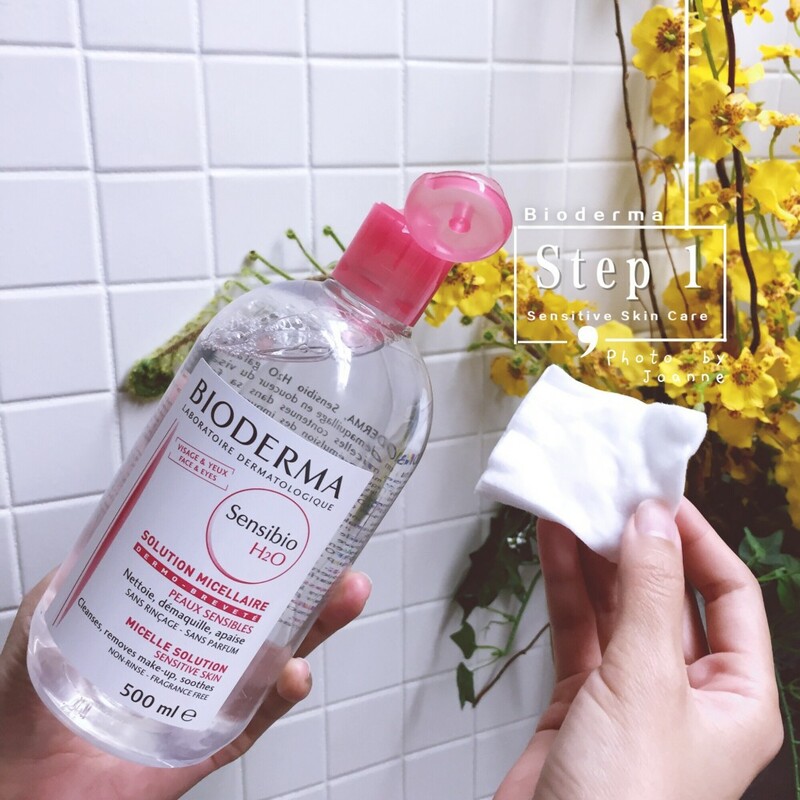 The first step in my routine begins when I get home from work and I remove all of my makeup with the Bioderma H2O Micelle Solution for sensitive skin. When my skin is sensitive, I don’t wear too much makeup, other than primer and powder for my face and a little eyeshadow. Bioderma’s water-like solution easily removes the makeup and is great for my sensitive skin. 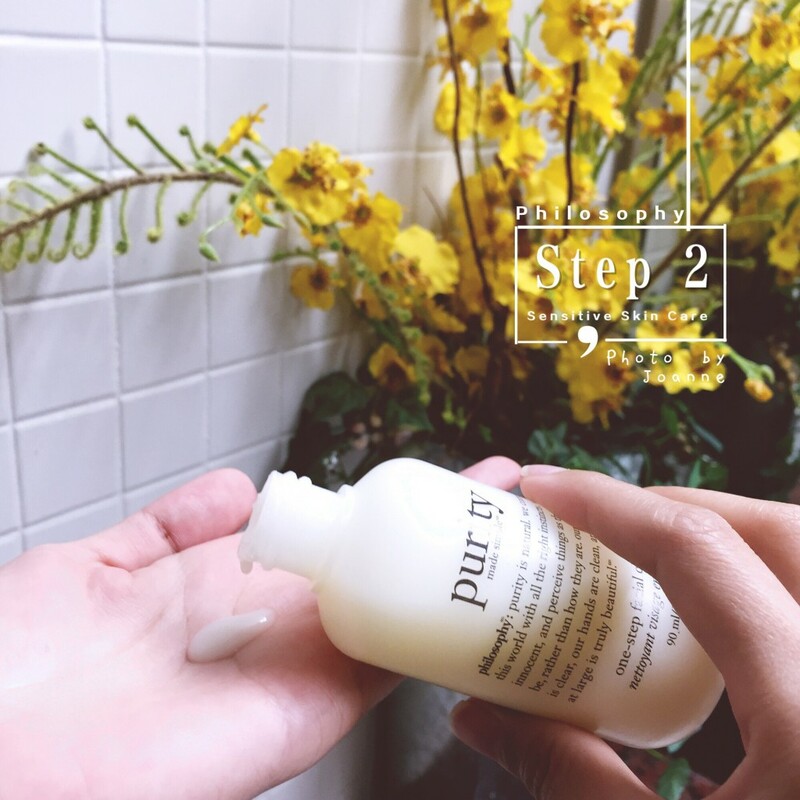 For cleanser, I discovered Philosophy’s Purity Cleanser through Allure’s Best of Beauty feature and from the recommendations by many beauty YouTubers. I find this to be perfect for my sensitive skin. I typically add a bit on my hands, massage it onto my face and then rinse it off. With a towel, I’ll gently pat my face dry. Following cleansing, I use the Simple Soothing Facial Toner all over my face. If my pores are enlarged, I’ll soak a few cotton pads with the toner and apply them onto my cheek and T-zone area, leaving it on for 5 to 8 minutes. When it’s colder, I’ll keep it on for a shorter period of time, because it makes my skin more dry. After removing the cotton pads, I’ll gently pat the face to help absorb the toner. The next step is to apply a moisturizing cream. 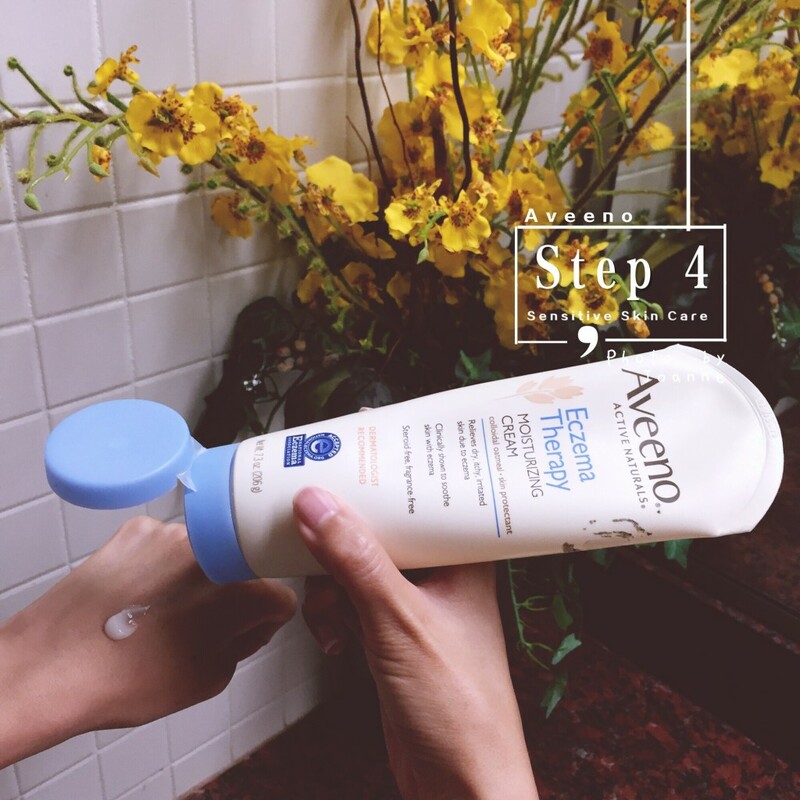 I found that the Aveeno Eczema Therapy Moisturizing Cream offers great hydration and also relieves dry, itchy and irritated skin. I’ll apply it every night as night mask. 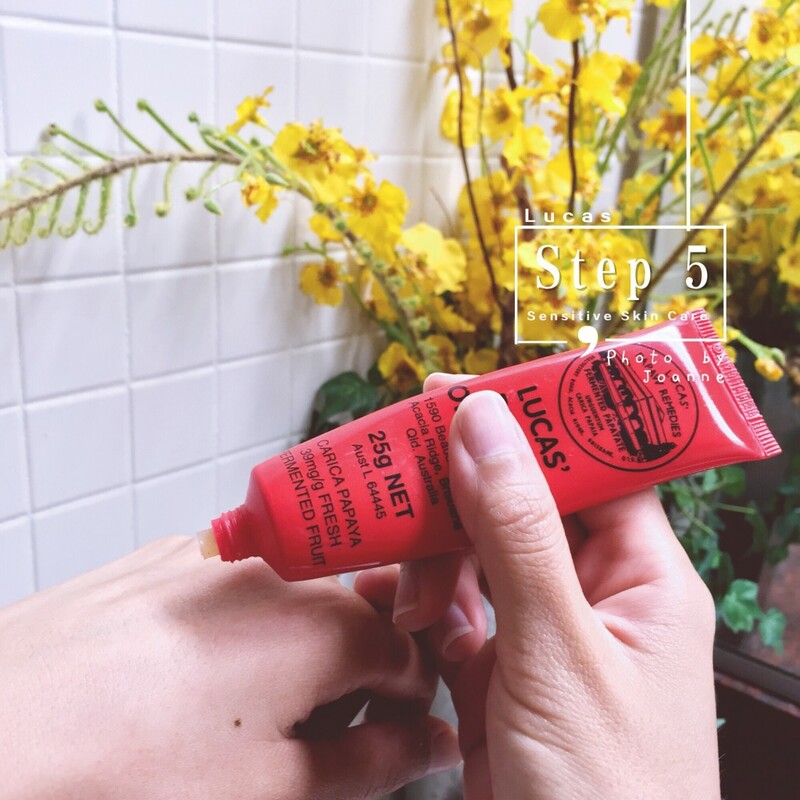 I also use a thick layer of the Lucas Papaw Ointment Remedies Cream on my lips and a thin layer under my eyes to keep them really hydrated. Another small tip to avoid any skin irritation is to tie your hair up or pin your hair away from you face while you sleep. I hope you found my fall skincare routine for sensitive skin helpful and let me know if you have any questions or if you’re interested in more information on how I take care of my sensitive skin. Good night and sweet dreams!